SOM’s design concept, BayARC, was selected as one of six winners in the Rising Tides international design ideas competition. Hosted by The San Francisco Bay Conservation and Development Commission (BCDC), the competition called for ideas responding to sea level rise in San Francisco Bay and beyond. Please find attached an article from the San Jose Mercury News about the competition and SOM’s winning submission. SOM’s BayArc concept was selected from the 130 competition entries from 18 countries received by BCDC. Design Partner Craig W. Hartman, FAIA, led the interdisciplinary design team for this project which included architects, designers, and structural engineers from SOM and marine engineers from Moffatt & Nichol. 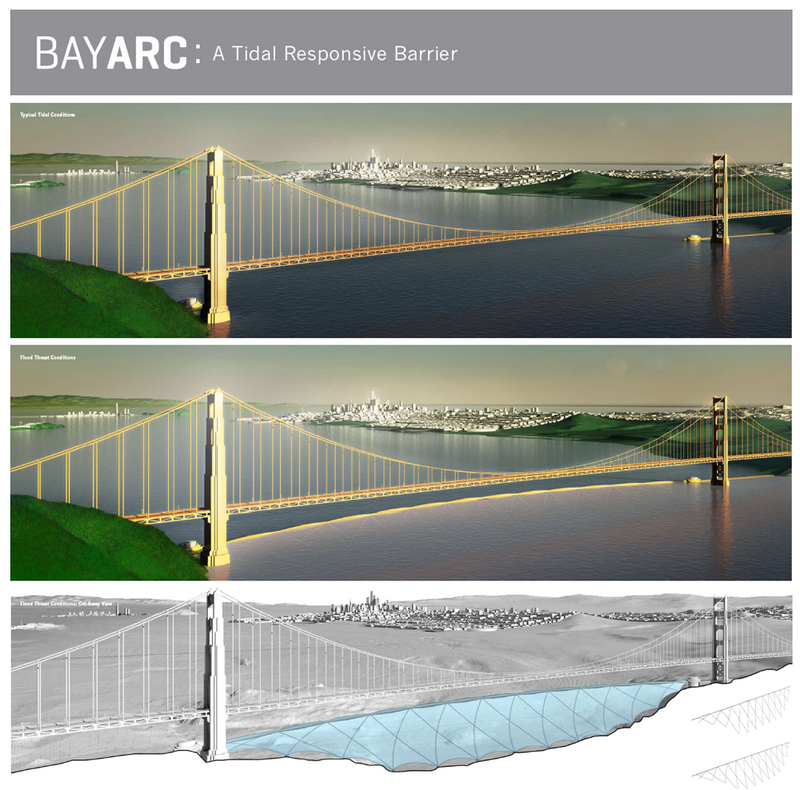 The winning BayArc design provides a lightweight and environmentally sensitive barrier to protect the San Francisco Bay Area from flooding due to rising sea level. A giant submerged curtain anchored under the Golden Gate Bridge that rises in storms to hold back big waves. Huge levees with pumps run by tidal power. Vast networks of new wetlands from Silicon Valley to San Francisco, some created on old parking lots and bay front warehouse sites. Science fiction? Maybe. Or perhaps San Francisco Bay in 100 years. On Tuesday, the ideas were among six winners in the “Rising Tides” contest, a design competition to engineer possible solutions for San Francisco Bay in the next century as its waters are predicted to rise as much as 41/2 feet due to global warming. The winners included some of the Bay Area’s most prestigious architectural firms, chosen from 130 entries from 18 countries. “We are going to have to deal with the issue of protecting the airports, Silicon Valley, and downtown San Francisco much sooner than we thought,” said Will Travis, executive director of the San Francisco Bay Conservation and Development Commission. Since 1965, the commission, a state agency, has regulated development around the bay shoreline. It sponsored the contest, along with the National Oceanic and Atmospheric Administration, or NOAA, which put up $25,000 in federal funding for prize money that was split six ways. San Francisco Bay already is rising. Since 1900, its waters have risen 8 inches, according to a gauge at Fort Point, beneath the Golden Gate Bridge, the longest continually monitored tidal gauge in the United States. According to a study last year by the U.S. Geological Survey, based on current warming trends, it will rise 16 more inches by 2050, and as much as 55 inches by 2100, as ice caps around the world continue to melt. That much rise would put major sections of the bay’s shoreline under water in future storms when tides are high, according to scientists at USGS and NOAA who have studied the data with computerized maps. Among the places most at risk: the runways at San Francisco and Oakland airports; Alviso, which already sits 7 feet below sea level due to land subsidence; major portions of the Dumbarton Bridge; Foster City, and much of San Francisco’s waterfront, including the Embarcadero, Mission Bay near the Giants AT&T ballpark and parts of Treasure Island. Almost any comprehensive solution could cost billions, from restoring huge amounts of wetlands to buffer the flooding to building higher levees and sea walls. Travis said his agency held the contest to get the public to start thinking about the issue. While 2100 is a long way off, 2050 is just “one refi of your current mortgage away,” he said. “We are going to have to be thinking about this and preparing for it much sooner than we thought. We don’t want to be in the Hurricane Katrina situation where you deal with fixing the levees after the city has flooded.” Chosen by a jury of architects and scholars that was chaired by Marcel Stive, scientific director for the Water Research Centre in Delft, Holland, the winning entries can be viewed at www. risingtidescompetition.com. Among the winners is “BAYArc,” designed by a team led by Craig Hartman, a partner at Skidmore, Owings and Merrill in San Francisco, along with engineers at Moffatt & Nichol Engineers in Oakland. Their idea is to stretch a carbon fiber membrane under the Golden Gate Bridge. It would be anchored to concrete pylons and would rise via an inflatable top in storms, limiting the amount of water and tidal energy that could come into the bay. The goal would be to negate the need for billions of dollars in permanent sea walls, since the main flood risk would only occur a few hours a year during big storms, said Hartman, who also designed the international terminal at San Francisco International Airport.